Stock photo of couple dressed in medieval clothing at the medieval markets on the grounds of Burg Ronneburg (Burgmuseum), Ronneburg Castle, Ronneburg, Hessen, Germany, Europe. Couple dressed in medieval clothing at the medieval markets on grounds of Burg Ronneburg. This stock photo shows a couple dressed in colorful medieval clothing at the medieval markets on the grounds of Burg Ronneburg (Burgmuseum), Ronneburg Castle, Ronneburg, Hessen, Germany, Europe. 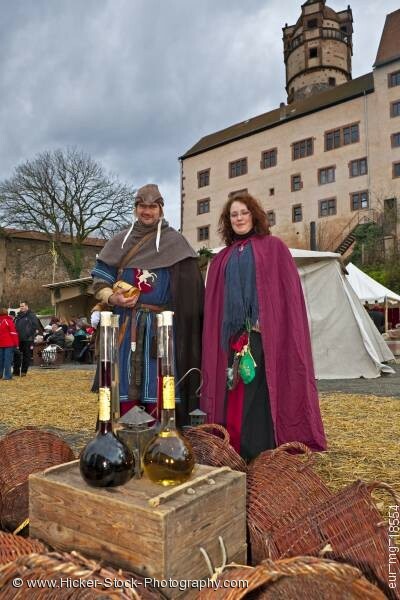 A couple dressed in medieval clothing during the medieval markets of Burg Ronneburg. The couple stands just behind a wood box displaying tall glass decanters. Each decanter has different color liquids in them along with a label on the glass. One of the decanters has a light golden color liquid and next to it a dark brown liquid. In the center of the decanters is a small metal lantern. Surrounding the wood box are large wicker baskets with handles are turned on their sides. In the background, straw is spread on the grounds of the medieval market. Couple dressed in medieval clothing at the medieval markets on the grounds of Burg Ronneburg (Burgmuseum), Ronneburg Castle, Ronneburg, Hessen, Germany, Europe.